This program is designed for those with good level of fitness, heading to Rinjani’s Summit 3,726 MASL. Starting and ending in Sembalun (Bawak Nao) providing spectacular views of the Crater Lake (Segara Anak) within the volcano’s crater and Best Sunrise over the summit. Pick up early from your hotel, register at the Rinjani Information Centre (RIC) in Sembalun Lawang, then the trek start with gentle ascent walking through open grassland to Pos 1 Pemantauan (1,300m), rest and enjoy the summit views of Mt. Rinjani from here. After rest onto Pos 2 Tengengean (1,500 m) about 1 hour walk up from Pos 1 Pemantuan than on another 1,5 hours to Pos 3 Pada Balong (1,800 m), reach this point around 1 pm. Rest and Lunch. After lunch continue the trek up to Sembalun Crater Rim (2,639m), this is the 3,5 hours climb amidst the pine-like Casuarinas species locally known as Cemara, perhaps seeing evidence of wild pigs and the long-tailed grey macaque monkeys along the trek to the camp site at Plawangan Sembalun (Sembalun crater rim 2,639 m). Reach the camp site around 5pm, set up the tent and enjoy the views of the crater rim. Dinner served at the camp site, rest and preparing your self to early wake up for the trek to the Summit on the following day. Wake up early morning and start the trek at 03:00 AM to the summit (3,726 m), a hard trek trail on volcanic screens, some part are steep and loose sand. It takes around 3 hours to reach the summit. Once there, enjoy proud feelings of satisfaction and the amazing sunrise views across the Wallace Line to Bali, Mt. Agung and Sumbawa. Stay at the summit 30 minutes to 1 hour to enjoy the views around and than going down to the campsite Sembalun crater rim through same route. Rest and breakfast at the campsite, after a well prepared breakfast, with the gentle descent walking to Sembalun Village passing Pos 3 Pada Balong (1,800 m), Pos 2 Tengengean (1,500 m) and Pos 1 Pemantauan (1,300). Lunch served en route. 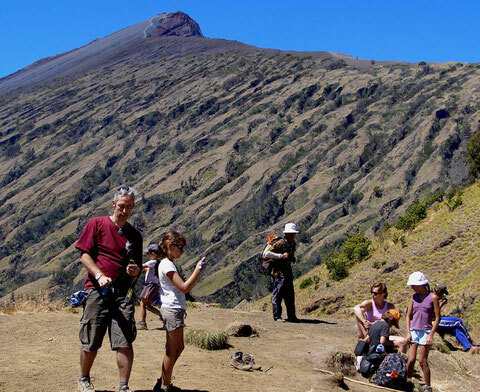 Rinjani Trek requires you to have a good level of fitness and ability to walk long distance. Person with mountain sickness or height phobia are not allowed to join this tour. Night temperature at the campsite can be very extreme. Extra socks and warmers are suggested.